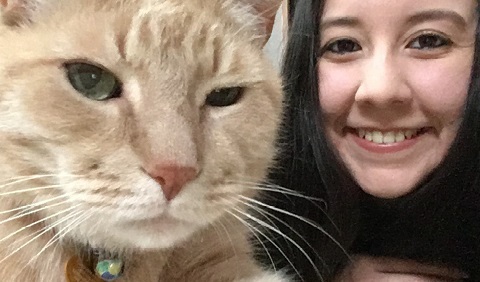 Bianca Leos, V’19 is currently a second year veterinary student at the Cummings School and is one of the officers in the Shelter Medicine Club. She was interviewed by Stacy LeBaron of the Community Cats Podcast. Please check it out at CommunityCatsPodcast.com and enjoy! 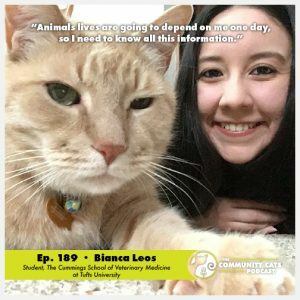 Bianca Leos is a student at the Cummings School of Veterinary Medicine at Tufts University. 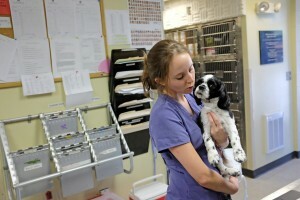 She intends to become a shelter veterinarian working in a high quality, high volume spay-neuter program. 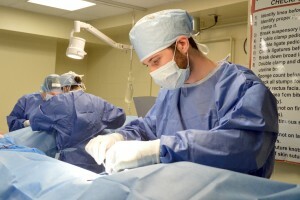 When Bianca first started at the Cummings School, she had intended to specialize in large animal medicine. After interning at a horse rescue, however, she changed her course towards rescue and sheltering. She highlights the many differences between the stray animal populations of the Northeast and her native Texas—working in the Cummings shelter has opened her eyes to community cats as a significant population, not just as individual strays.